If Pirates of the Caribbean became a successful animated slot game then I’m pretty sure this is the slot that it would become. Even the lead male looks like Captain Jack Sparrow. 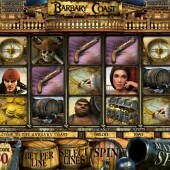 This 5-reel, 30-payline slot from developer Betsoft Gaming has some smooth graphics, intriguing characters dotted around the reels and an atmosphere that will make you feel like you’ve been thrust straight into a live action version of Treasure Island. Symbols across the reels are all things you might attribute to pirates and the high seas including a skull and crossbones, pistol, gold coins, compass, cannon, parrot, a barrel of rum (or water, but more likely to be rum - gargh!) and a treasure chest of gold. Not to mention an array of pirate-looking characters. There are no standard Scatters on the reels and instead you are given a number of symbols that can trigger a range of bonus features where you can win some prizes and coins. There is a Wild symbol that is in the form of the cannon. If you hit this cannon on the central reel then the entire reel will turn Wild for one spin. 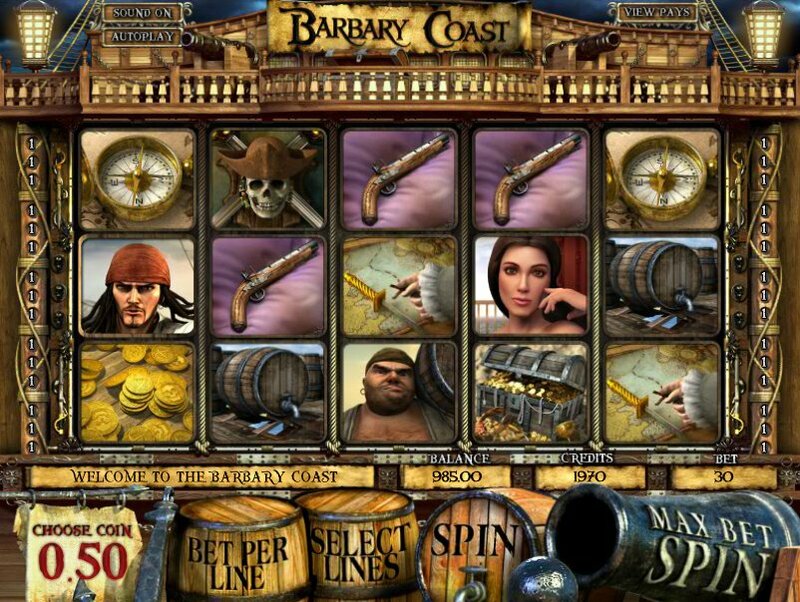 If you hit three or more of the Captain Jack Sparrow lookalike, named as Ben Sawyer in this slot, then you will trigger the Dashing Sawyer Click Me Bonus. This is a simple case of selecting one of the symbols presented to reveal a prize. If you hit three or more of the Captain Blackbeard symbols then you will trigger the Fight Bonus. In this feature you must fight Captain Blackbeard to save the love interest and win a prize. The most amusing bonus feature is the Grog Challenge Bonus which is triggered when you hit three or more of the Worker Pirate symbols across the reels. In this bonus, you will take on the worker in drinking competition. If you win then you will get a reward. Despite there not being any Scatters on the reels, there is still the chance to earn some free spins. These free spins can be won if you hit three or more of the parrot symbols across the reels. Unfortunately, these free spins cannot be re-triggered during the free spins. There are already a number of pirate-themed slots out there and you don’t have to look much further than NetEnt’s eerie Ghost Pirates slot to see the full potential of slots with this theme. 3D slots are always a delight to play and this slot is no different. I wish the Wild was more prevalent than just in the form of a cannon that results in an Expanding Wild every now and then but at least the Wild is there in some form. I have to admit I did enjoy playing this slot and will certainly be going back to play it again.